January 13, 2019 at 12:07a.m. Luke Petrony likes to construct indoor gardens, and Giorgio Restaino has an interest in the history of the infamous RMS Titanic that sank April 14, 1912, in the North Atlantic Ocean. What connects the boys’ diverse and unrelated interests? Creating them through Lego plastic building systems. “The bottom part is red, the middle is black, the top is white and the top-top was peach,” explained Giorgio, 7, a Holy Family School second-grader, referring to the hierarchal color patterns of interlocking toy pieces he used to build a replica of the doomed passenger ship that struck an iceberg off the coast of Newfoundland during its maiden voyage. After completing his version of the huge ocean liner, Giorgio added toy figures representing people and lifeboats. 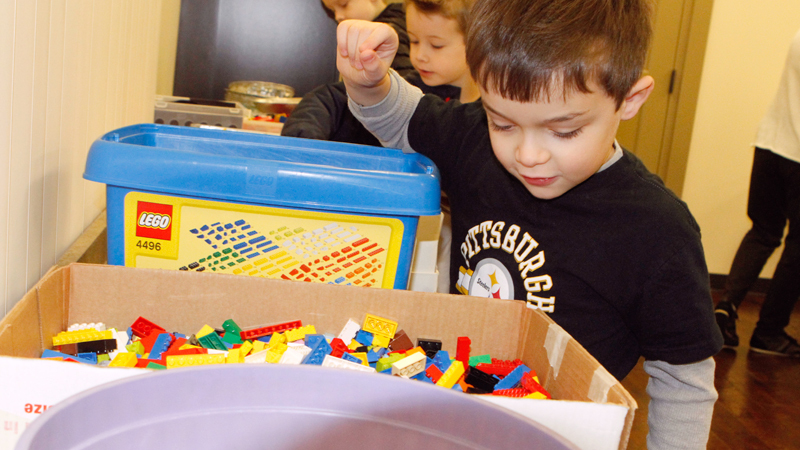 He also was one of the youngsters who put his creativity and motor skills to the test, courtesy of Saturday’s Lego My Library gathering at the Boardman branch of the Public Library of Youngstown and Mahoning County, 7680 Glenwood Ave.
“The kids kind of get to show off their creative skills. It’s also free advertising for the library,” said John Yingling, one of the branch’s three children’s librarians. Participants’ finished projects will be placed atop some of the bookshelves for one month for patrons to see, he added. Luke, 8, also a Holy Family second-grader, assembled what he called “a dream house,” which featured, besides the indoor garden, a wide range of parts including a ladder, a mailbox, a control device and an airplane wing. Perhaps as varied as the components of his house was his list of favorite classic-rock and oldies legends that are part of another collection of his that consists of 25 compact discs of music by groups such as the Beatles, Pink Floyd and Led Zeppelin. The age-old traditional concept of good vs. evil was evident in the project Luke’s 6-year-old brother, Matthew Petrony, diligently assembled. “I have a series of 11 bad guys and five good guys,” Matthew said as he counted the Lego figures he had lined up on the side of one of two green platforms. The brothers came to the event with their mother, Mary Petrony. Giorgio’s mother, pharmacist Barbara Restaino, explained that Giorgio had plenty of practice constructing the Titanic before assembling his interpretation of the ship Saturday because he and his father had previously constructed a replica from a toy set they had ordered online. Since Giorgio also is a huge Pittsburgh Steelers fan, it’s probably not difficult to guess what Lego project he and his father are currently working on: a replica of Heinz Field. January 8, 2017 12:07 a.m.
June 24, 2011 12:05 a.m.